It’s almost here! With the first day of spring coming up and weather beginning to warm, we were eager to dig in the dirt around here. So here’s a quick idea for creating an herb garden. 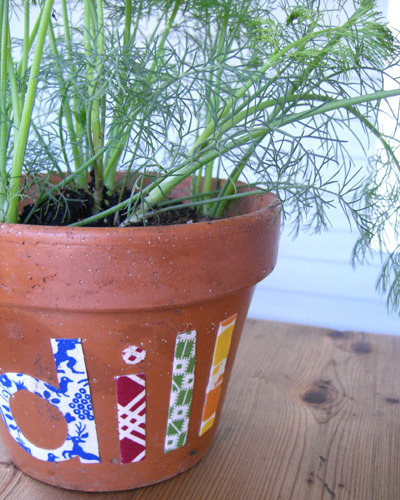 This is a great way to use plain terra cotta pots that you might already have on hand. Simply cut out your letters according to this template. We used fabric since I have loads of it, but patterned paper would work as well. Then have the kids brush the back of each letter with the decoupage glue and adhere the letters to the pot. It’s a great spelling lesson and my kids loved to get goopy glue all over their hands. Brush over the top with more glue and continue to cover the entire pot for a glossy look. Allow to dry for 48 hours. 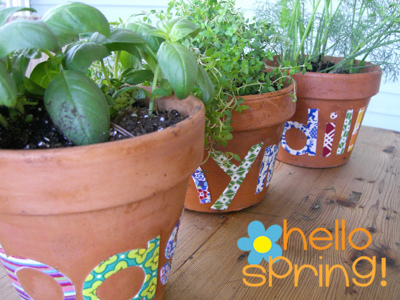 Then plant with your favorite herbs, put your pots in a sunny spot and enjoy fresh herbs all spring and summer long! Love this idea – I’ll definitely be making some! Cute pots! My kids would love doing this. Love this idea! Doing it today! What a terrific idea! The terracotta posts are so adorable. Can’t wait to do this with my niece. 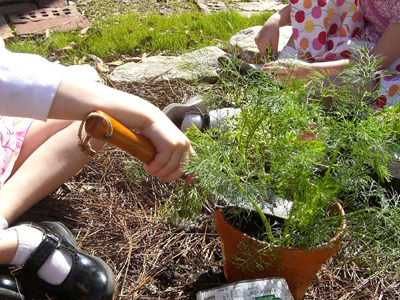 She’ll enjoy this project…we’ve been gardening together since she was a baby. This is so adorable! I love the font in the mismatchy fabric and paper on the pots!!! L-O-V-E it!!! I’ve been thinking about how to spruce up my herb planting this summer. This is perfect!